Mainly painting again this week - started four new paintings and done more work on six others, from changing the background to fully finishing. Eight of these should get finished over the next week and then I'll move on to finishing the five still lifes that have been in progress since before May. 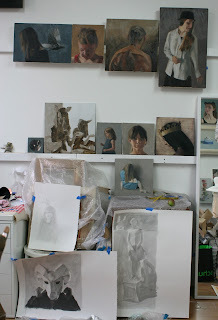 It will be a relief both to finish the uncompleted works and to get a batch of new paintings up on the walls. Although I'm itching to get started on some bigger paintings based on the drawings I've done so far that might have to wait a few weeks until after the Open Studios at Hanson Street in the first weekend in October. Up until then I'll mainly be limiting myself to smaller works - I've been having ideas about a new series of works, all 12x16 inches. The plan presently is to spend Saturday doing drawings in preparation for these, so we'll see how it goes.